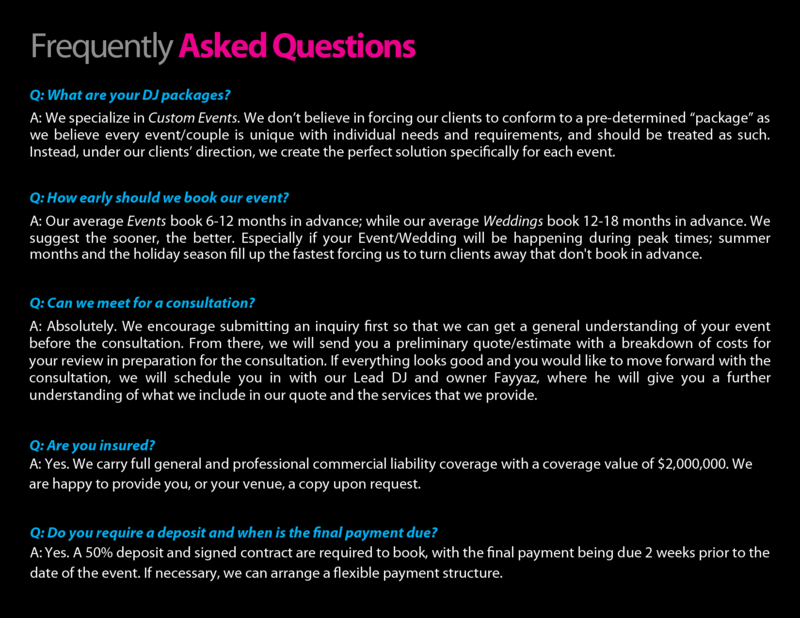 What are your DJ packages? We specialize in custom events; we don’t believe in forcing our clients to conform to a pre-determined “package” as we believe every event/couple is unique and deserves to be treated as such. 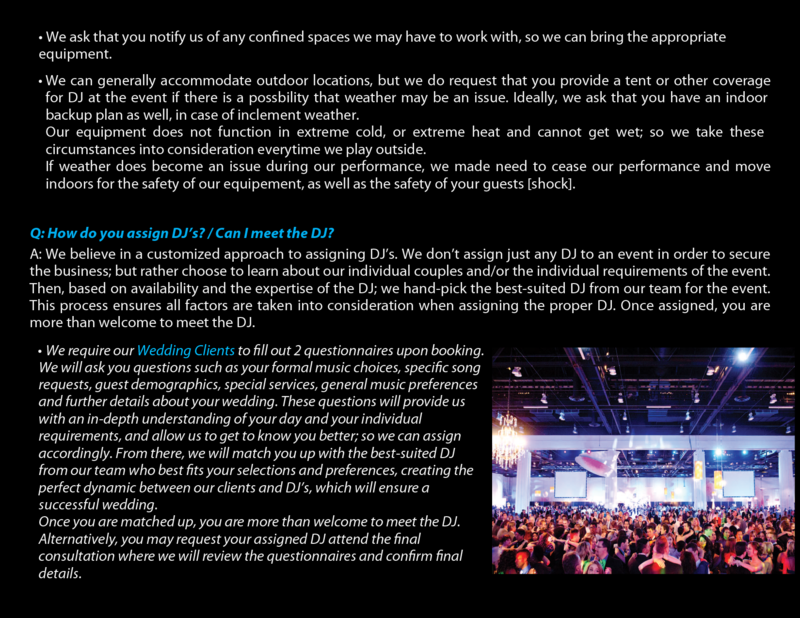 Instead, under our clients’ direction, we create a solution specifically for each event. When should we book our event? Our average events book 6-12 months in advance, while our average weddings booked 12-18 months in advance. We suggest the sooner, the better. Yes. We carry full liability insurance with a coverage value of $2,000,000. We are happy to provide you or your venue a copy upon request. Do you require a deposit and when is tjhe final payment due? Yes. A 50% deposit and signed contract is required to book, with the final payment due 2 weeks prior to the date of the event. We accept all major credit cards, cash, cheque, email money transfer and PayPal. There is a 3.6% surcharge for credit card and PayPal transactions. What if the event time is changed after the contract is signed? We are flexible in these matters and understand that as the event planning progresses, things change. We will accommodate these changes within reason. Cancellation for any reason forfeits the deposit. Cancellation within 60 days of the event date requires a $300.00 fee. Cancellation within 7 days of the event date requires full payment of the balance. Cancellation due to uncontrollable circumstances will be dealt with on an individual basis. 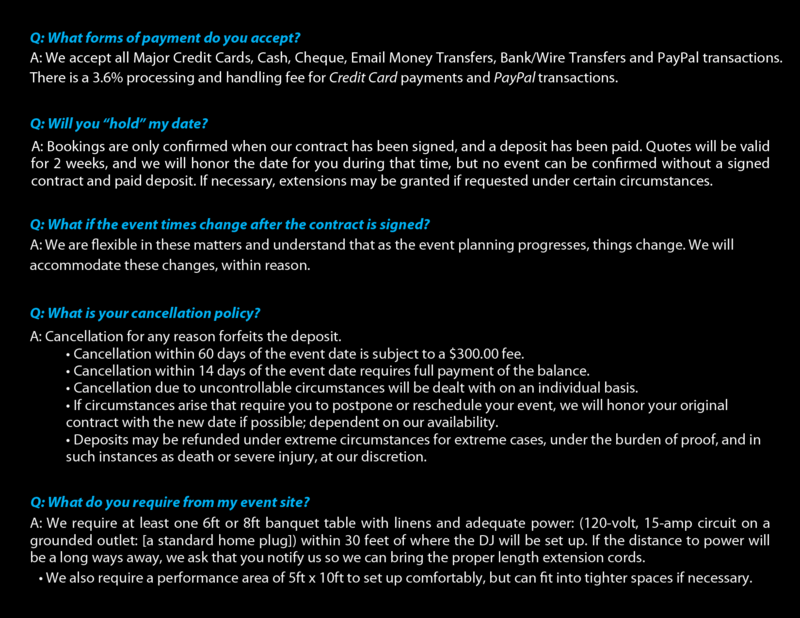 If circumstance arise that require you to postpone your event, we will honor your contract with the new date. Deposits may be refunded under extreme circumstances for extreme cases, under burden of proof and in such instances as death or severe injury, at our discretion. Can we request overtime if the event goes longer than anticipated? Yes. 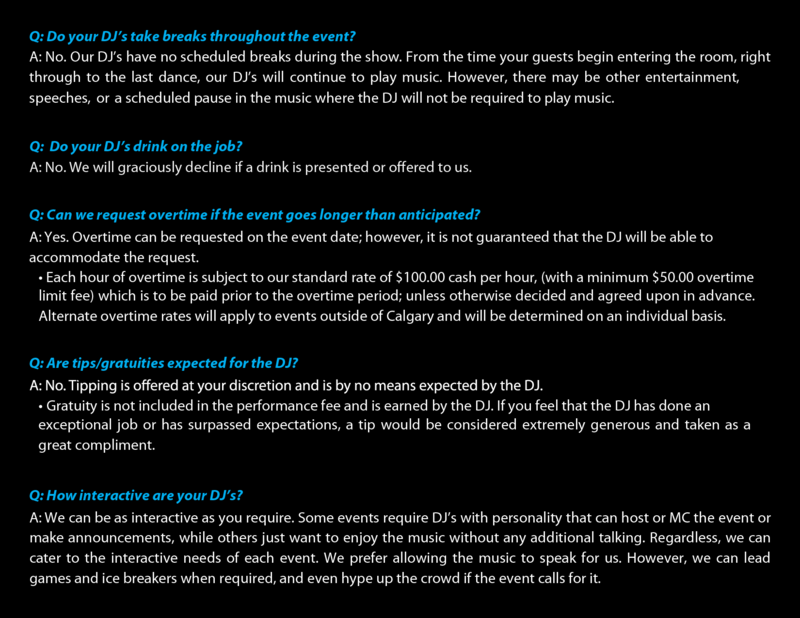 Overtime can be requested on the event date; however it is not guaranteed that the DJ will be available to accept the request. Each hour of overtime will be subject to standard rate of $100.00 cash per hour, (with a minimum $50.00 overtime limit fee) to be paid prior to the overtime period; unless otherwise decided and agreed upon in advance. Can we view your music database? Unfortunately not. We have over 150,000 songs in our database which would take an unnecessary long time to go through. We do take requests and will make sure we have any specific song you want, and with our expertise we will help you choose the perfect music for your event. 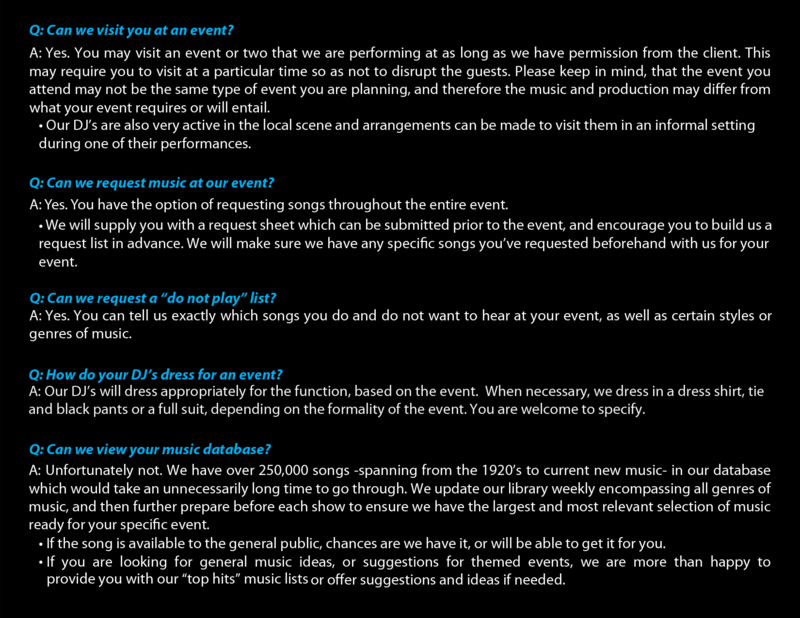 Can we request music at our event? Yes. You can tell us exactly which songs you do and do not want to hear at your event, as well as certain styles or genres of music. Can we choose the music the DJ will play at our event? Yes. We will work with you to create the perfect music atmosphere for your event and allow you to customize the music throughout, so there are no surprises at your event. We require at least one 6 or 8 foot banquet table with linens and adequate power (120-volt, 15-amp circuit on a grounded outlet) within 30 feet of where the DJ will be set up. 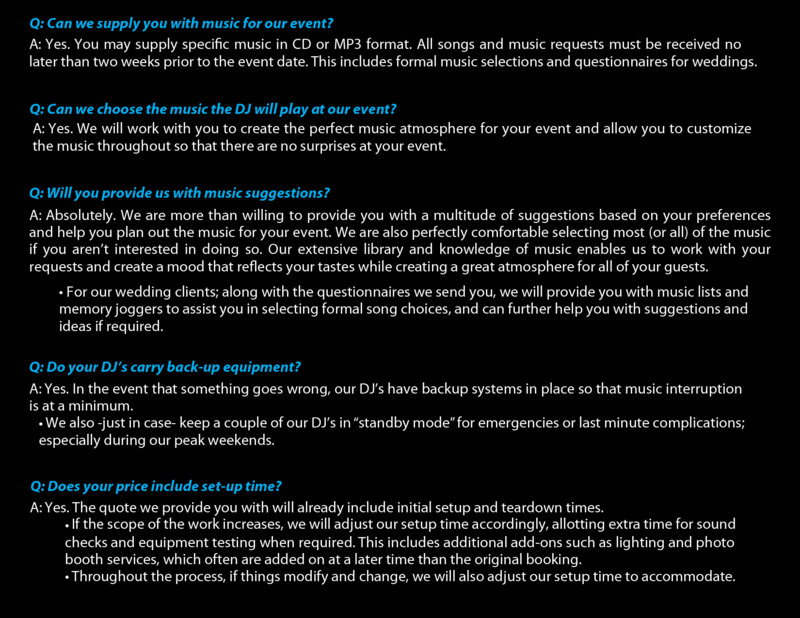 Do your DJ's carry back-up equipment? Yes. In the event that something goes wrong our DJ’s have back-up systems in place so that music interruption is at a minimum. We also -just in case- keep one of our DJ’s in "standby mode" for emergencies or last minute complications on our busier weekends. Yes. The quote we provide you will already factor in setup and teardown time. Are there any extra costs in addition to the DJ quote? No. All costs will be included in the quote with no additional fees or hidden charges. Is there a travel charge for long distance? 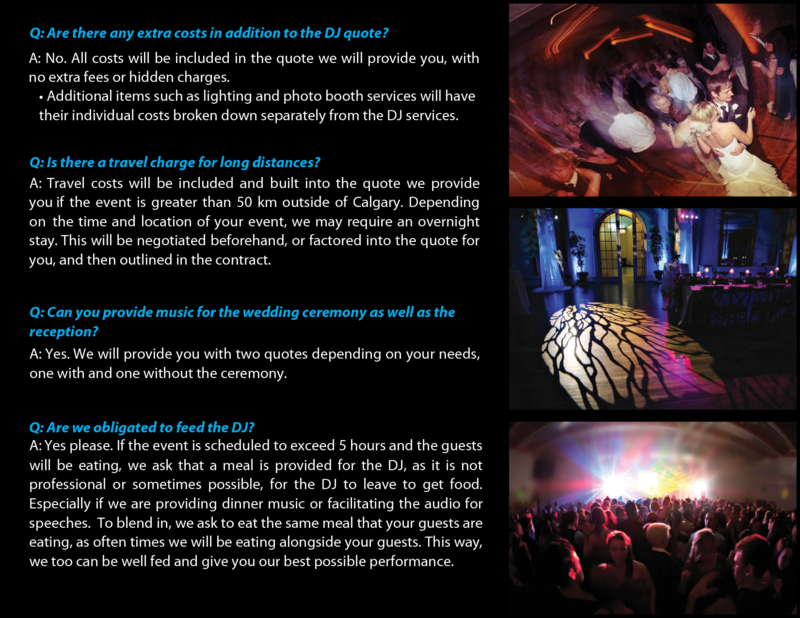 Travel costs will be included and built into the quote we provide if the event is greater than 50km outside of Calgary. Depending on the time and location of your event, we may even require an overnight stay. This will be negotiated beforehand and then outlined in the contract. Can you provide music for the wedding ceremony as well as the reception? Yes. We will provide you with two quotes depending on your needs, one with and one without the ceremony. What makes you different from other DJ companies? 1) Our DJ’s DJ for a living. To them, DJing is a form of lifestyle and not just a “part-time” job or hobby. They are all current in the scene showcasing multiple events a month. 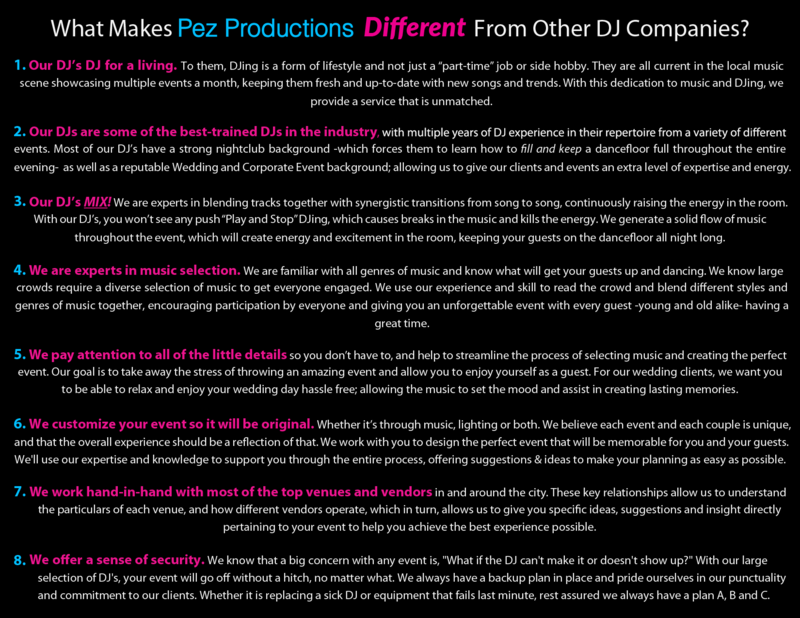 With this dedication to music and DJing, we are able to provide a service that is unmatched. 2) Our DJs are some of the best trained DJs in the industry, with multiple years of experience in their repertoire from a variety of events. 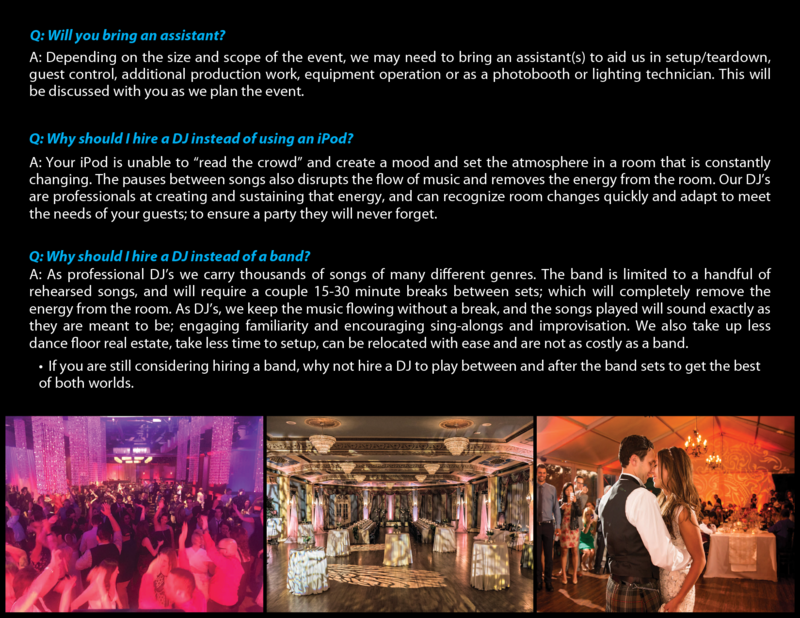 Most of our DJ’s have a strong nightclub background -which forces them to learn how to fill and keep a dancefloor full- as well as a reputable wedding background, allowing us to give our events and clients an extra level of expertise and energy. 3) Our DJ’s mix. We are experts in blending tracks together with synergistic transitions from song to song raising the energy in the room. You won’t find any push “Play and Stop” DJing, which creates breaks in the music. We will have a solid flow of music throughout the event which will create energy and excitement in the room keeping your guests on the dancefloor all night long. 4) We pay attention to all of the little details so you don’t have to, and help streamline the process of selecting music and creating the event that you envision. Our goal is to take the stress of throwing an amazing event away from you and allow you to enjoy yourself as a guest. For our wedding clients, we want them to be able to relax and enjoy their wedding day hassle free; allowing the music to assist in creating lasting memories. 5) We customize your event so it will be original. We believe each event and each couple is unique, and that their events should not be cookie-cutter and similar to someone else’s. We work with you to design the perfect unique event that will be memorable for you and your guests. We will use our expertise and knowledge to support you through the entire process, offering suggestions and ideas to make your job as easy as possible. We also work hand-in-hand with many of the top vendors and venues in the city, to ensure our clients get the best possible experience. 6) We are experts in music selection. We are familiar with all genres of music and know what will get all your guests up and dancing. We know large crowds require a diverse selection of music, and we use our experience and learned ability to read the crowd to mix different styles and genres of music together; to give you a one of a kind event with every guest having a great time.